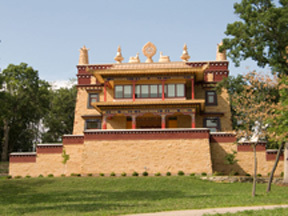 Deer Park Buddhist Center and Monastery is devoted to ensuring that Tibetan Buddhist teachings and the monastic way of life, as well as Tibetan culture, remain available as a vibrant part of our common human legacy. Supporting people’s moral and spiritual growth, as a means to bring about temporary and lasting peace for them individually and throughout the world. Educating, training, and inspiring local and international monastic and lay students in the philosophy and practice of Tibetan Buddhism. Serving as a monastery where Tibetans and non-Tibetans alike can observe and experience Buddhism as a complete living tradition in a tranquil rural setting that is particularly conducive to the contemplative monastic lifestyle. While a growing number of Tibetan Buddhist centers across the United States and in the Midwest offer study and meditation programs, Deer Park does so under the guidance of a resident monastic community. As such, Deer Park is uniquely positioned to provide an experience of this integral part of the Buddhist path, and to teach by its example as well as by its words. “It should be understood that wherever the monastic lifestyle exists together with the sincere practice of the prescribed monastic activities, there the Buddha’s teaching abides. Likewise, it should be understood that wherever the monastic lifestyle does not exist or exists but without sincere engagement in the prescribed monastic activity, there the Buddha’s teaching has perished. A passage from the Vinaya Sutra (the Buddha’s explanation of the monastic life) as quoted in a commentary by Gendun Drup, the 1st Dalai Lama. Deer Park is located amidst the rolling hills and fields of Oregon, Wisconsin, south of Madison. A large house provides living quarters and offices. An annex building, completed in 1995, provides additional living quarters for the monastic community and visitors as well as for the community. In Iowa City: take Rt 1 going north to rt. 151. Take Rt. 151 to last Verona exit, PB. (This will take about 3 and 1/4 hours). PB swiftly connects to M. Take M to MM and turn left onto MM. to your right. Walk to temple. Deer Park is open weeklong to visitors who would like to see our temples, circumambulate the stupa or simply take in the serenity and beauty of the land. The temple doors are open on Sundays from 9:00 a.m. to 2:00 p.m. If you would like to visit on a weekday either call ahead to 835-5572 or when you arrive, please go to the main ranch style house and ask the monks to unlock the temple for you. If you would like to bring a large group to see the temple, we ask that you schedule the visit in advance, so that we might prepare seating and provide a guide for your tour. Please contact Sherab at lsherab@hotmail or call his cell # 608-332-7080. Deer park has a large parking lot available for visitor parking, which is immediately on the right just after one enters the Deer Park driveway. Senior and handicapped parking is available just to the right of the large temple. The upper driveway of Deer Park is reserved for resident vehicles only. At Deer Park we ask that visitors observe the etiquette customary at Asian religious centers. Please remove your shoes in the temple vestibule prior to entering the main hall. While Deer Park is a religious center open to the public, it is also a functioning monastery, so we ask that visitors please refrain from loud or boisterous behavior in the temples or on the grounds of Deer Park. If you feel inclined to make an offering to Deer Park, please use the donation boxes located in the vestibules of the temples. Photographs for personal use are permitted, so please feel free to take snapshots of our beautiful temples, stupa and grounds! Deer Park has two temples on its grounds that are open to the public. The large temple with the gilded roof is the Main Temple, where Sunday and Thursday services, and yearly courses of lectures on Buddhist philosophy and practice are given. One may find it inspiring to climb the large stairways at the front of this building to enter through the traditional Tibetan temple doors at the top, but there is also an entrance at the base of the right stairway through which an elevator to the first floor and men's and women's restrooms can be accessed. The mezzanine level of the Main Temple houses residential quarters, and we ask that visitors refrain from venturing outside of the basement and first floor. Just atop the right shoulder of the hill on which the Main Temple sits, situated in a cool grove of trees one will find the Kalachakra temple. The Kalachakra temple was erected as an open pavilion in 1981 to serve as the venue for the very first Kalachakra initiation given outside of Asia by His Holiness the XIV Dalai Lama. The structure was then converted into a closed, permanent structure, and was used as the Deer Park temple from 1981 until 2008. Since the construction of the Main Temple, the Kalachakra Temple has been used as a quiet space for silent meditation or prayer and the monthly family dharma group. Cushions can be found in the closets in the temple vestibule. Just behind the Kalachakra Temple, one will find the Kalachakra Stupa, erected to commemorate the bestowal of the Kalachakra initiation on the site in 1981. The stupa is a shrine symbolizing Buddha's enlightenment, and is filled with sacred books, mantras, statues and prayers. A statue of Shakyamuni Buddha sits in a niche facing the East. The stupa is surrounded by two circumambulation circuits, which are meant to be walked in a clockwise direction while reciting prayers, engaging in contemplation or simply enjoying the beauty and serenity of the grounds. There are a wide range of Deer Park activities, reflecting the many interests of its members and the spirit of the Buddhist idea that a diversity of methods can be used to promote the welfare, mutual understanding and happiness of living beings, and to encourage people's moral and spiritual growth. We are a religious community with a nucleus of monks following the traditional Buddhist monastic discipline, pursuing study and religious practice. Our lay members participate in religious services, and in the study of Buddhism on an ongoing basis. Religious teachings are given by one of our several resident monks and by eminent visiting teachers. We support the preservation and furtherance of the rich and ancient Tibetan culture, the cause of Tibetan freedom, as well as the needs of the Tibetan diaspora. To this end, we have sponsored educational and cultural programs, such as Tibetan dance, drama, and musical performances, and the multi-media tour of the Sera Chay monks. We have also worked to raise awareness of Tibet in Wisconsin, have organized the very successful plan to resettle Tibetan refugees in the Madison area, and have closely cooperated with this thriving local Tibetan community to coordinate events of mutual interest. A separate but affiliated organization works to advance the goal of Tibetan independence and human rights. We wish to reach out to Christians, Jews, Muslims and members of other faith communities for a dialogue to help us recognize our areas of common concern as well as to understand our differences of philosophy and belief. Deer Park members have been actively involved in local interfaith organizations, and clergy from other faiths have participated in our celebrations and discussions. We are continuing this tradition with interfaith seminars and other events. Teachings on the graduated path to enlightenment are offered on a weekly basis as well as occasional Tantric teachings for more senior students. Each Sunday morning at 10:00 a.m. to noon Geshe Sopa, or one of the resident geshes, offers religious teachings. A special worship service, the Jorcho puja, is given monthly at the beginning of these Sunday teachings. There are also teachings given by different teachers on most Thursdays from 7:30 p.m. to 9:00 p.m.
On the 10th day of the Tibetan month, the Lama chopa puja is offered with tsog (food sharing) at 7:00 p.m. and on the 25th of the Tibetan month, the Vajra Yogini worship is held, with tsog, at 7:00 p.m. In addition, worship services are held annually on Wesak, the anniversary of the Buddha's birth, enlightenment, and Parinirvana (May or June); H. H. the Dalai Lama's birthday (July 6); the anniversary of the death of Tsongkhapa (December); and on various other occasions. Special intensive courses and retreats are also held at regular intervals. The Deer Park collection, developed from the bequest of Prof. Robinson's Buddhist Studies library as well as other generous gifts, includes many original Tibetan texts in traditional woodblock prints and modern formats, books on Tibet and Buddhism in English and other European languages, and a complete set of audiotapes of teachings that have been given at Deer Park over the years. All works are available for consultation, and many can be lent out. The new temple which was opened officially in 2007 is being used extensively for large and small teachings and ceremonies, including long life pujas and tantric initiations. The Kalachakra Temple which is now only to be used for small, special events was initially built as an open pavilion for the Kalachakra initiation given by H. H. the Dalai Lama in 1981--the first such initiation bestowed in the West. The temple is furnished in traditional Tibetan style with many beautiful paintings (tankas) and tapestries depicting the life of the Buddha and other religious figures. The altar is enhanced by Buddha images, offerings and a complete set of the Tibetan Buddhist scriptures, the Kangyur and the Tengyur. Stupas were the earliest physical representation for the remembrance of the Buddha, an elaboration of the funerary mounds which existed in India from earliest antiquity. They were venerated by pious Buddhists for centuries before images and other concrete representations began to be worshipped. In the Tibetan tradition, the stupa has come to represent the perfectly enlightened mind of the Buddha, and is a place of prayer and meditation for worshipers, who circle it in a clockwise direction. The stupa, located behind the temple and built by members of the Deer Park community, was dedicated by H. H. the Dalai Lama in 1989. Deer Park’s routine activities are supported entirely by donations from our students and friends. With typically five to seven resident monks in residence, the current annual cost to provide food and a small stipend for the monks; to clean and maintain the temple, stupa, two houses and grounds; to provide audio-visual materials and equipment for classes; and to accommodate occasional guest teachers, is approximately $120,000.00 per year. About one quarter of our current donations come through a pledge system. Pledges are very helpful to us for purposes of planning, and we encourage anyone who wishes to offer regular support to join the pledge system. We are very grateful to receive cash or check donations of any amount. Click on icon to get free Acrobat Reader for PDF files.